It is a malignant form in which cystic formation occurs in glandular epithelium due to accumulations of secretions . It is formed by tumor line cystic growth pattern. Serous cystadenoma is serous fluid similar to serum, typically pale yellow, transparent in colour and starting of benign tumor. They include mucus and serous cells. They play a major role in digestion, respiration and excretion. Papillary cystadenoma is rare malignant tumor. It is classified as low grade or high grade. Mucous secreting cells are formed. It is arising from the submandibular gland. Mucinous cystadenoma is common in ovaries. They are highly massive. 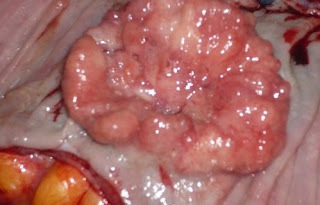 Serous cystadenoma in the pancreas cause abdominal pain, vomiting, nausea, but it does not cause jaundice. Mucinous cystadenoma delayed or known at end stage due to women wrong perception of getting fat or menopause or may ignored her symptoms . In this way tumor will grow progressively. Malignant tumor grows large and becomes very painful. May show symptoms of bloating, back pain, increase in urination, pelvic pain, abnormal vaginal bleeding, weight loss, constipation, tiredness and discomfort. Papillary cystadenoma patients have no symptoms in start but in severe cases may suffer from increase in abdominal bloating due to accumulation of abdominal fluid. Cause of papillary cystadenoma is occurrence of salivary duct carcinoma, polymorphous low grade carcinoma, having different types of malignancies in different portion of body. They are caused by increase in fluids and tissues outgrowth. Mucinous cystadenoma is caused by excessive fluid or mucus. It may include family history, late menopause and infertility. Laparoscopy is done for cystadenocarcinoma findings. CT scan must be done for benign serous tumors and first portion is done for diagnosing the stage after evaluation of cystadenocarcinoma. MRI is the best choice of detection of ovarian cancer and detection of lymphatic and peritoneal tumor. Ultrasonography (US) provides the diagnostic feature of cystic masses in the body, it can detect 90% of cyst masses. Endoscopic ultrasound may also conduct for exact diagnosis. Ultrasound allows to capture pictures of scan for detailed evaluation. Biopsy will also provide better examination of cyst masses and provide definite diagnosis of exact forms of cystadenocarcinoma. Firstly cystadenocarcinoma is treated by surgery for removal of particular cyst depending upon the stage and location of mass but the patients who is not fit for surgery must given chemotherapy or medications . Gestronol Intramuscular injection will be given or continuous oral cyclophosphamide will be given. Surgery should be used in combination with chemotherapy with taxane and platinum compound. The survival of patient depends upon the severity of disease. Patients suffering from peritoneal cystadenocarcinoma treated with cytoreductive surgery and platinum chemotherapy. Follow up should be done at 2 to 3 months for the first 2 years right after the treatment.